In 2015, I was photographing a road trip through New England when I stopped in Providence, Rhode Island for a couple of days to visit Ben Sukle at his small, counter-seat restaurant birch. Sukle’s (pronounced soo-kohl) cooking focuses on the products of his region, which he is quick to point out, is surprisingly diverse. 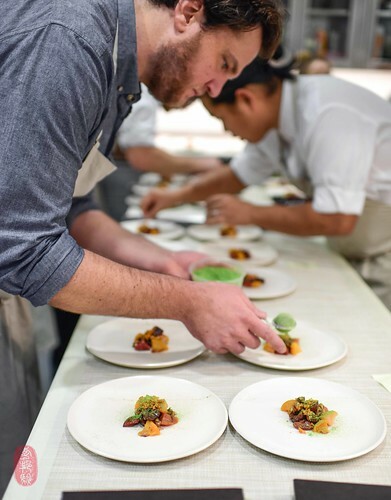 The smallest state in our American Union happens to encompass both farmland and sea coast, so both fresh seafood and farm products are available within an hour’s drive of his restaurant. As a visitor, this means that I was able to cast a relatively wide net in a short amount of time. 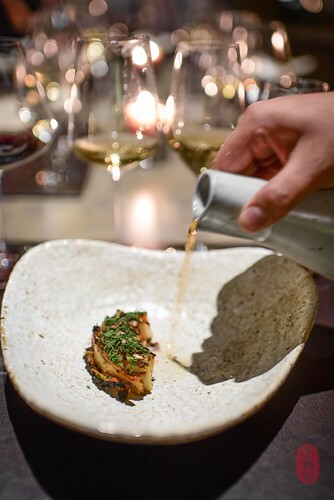 In just a little over 48 hours, Ben and his wife Heidi took me on an eating crawl that included chowder, lobster rolls, and vintage Italian-American cookery – pizzas at Il Forno, and baked polenta and cold snail salads at Mike’s Kitchen inside the V.F.W. hall in Cranston. In the years since, I’ve had the pleasure of Sukle’s company at events around the country. He’s ever-curious and highly intelligent, both of which are evident in his approach to cooking. 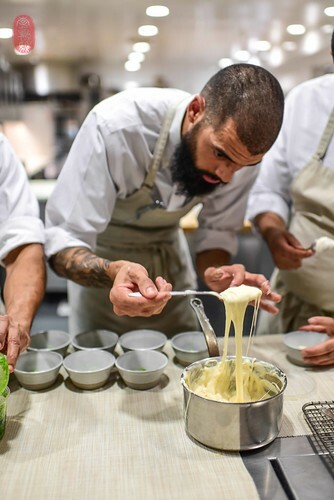 The fact that he’s also extremely articulate, with an admirable alacrity both in and out of the kitchen, also explains why I was particularly excited to see him on this year’s roster at the Twelve Days of Christmas at The Restaurant at Meadowood. 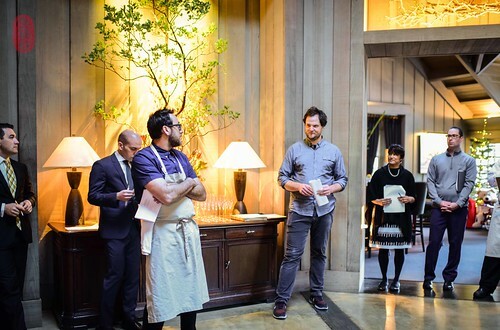 There was a lot of synergy among Sukle’s and Christopher Kostow’s dishes on this fifth night. As a result, I think it was one of the stronger dinners in this year’s series. 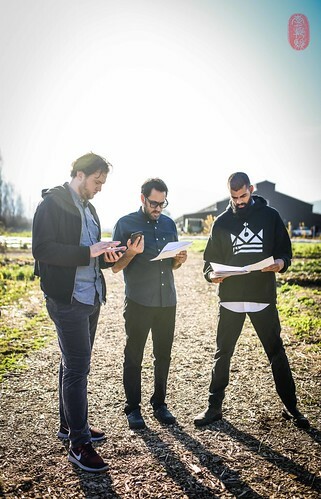 Sukle applied his east coast perspective to west coast ingredients. He spread Dungeness crab brains on toast, with brown butter and rose petals; a canapé. The crab meat he picked out and served in a cold dish with sugar kelp and mustard. Kostow’s pasta dish – a whelk farce inside of pasta shells shaped vaguely like the sea snail, with agretti and sea beans – approximated the brinier Atlantic waters, and reminded me of the cold seafood salad I had with Sukle in Cranston. This dinner was also particularly strong because, on this night, Kostow’s team produced some of my favorite dishes of this year’s Twelve Days of Christmas. 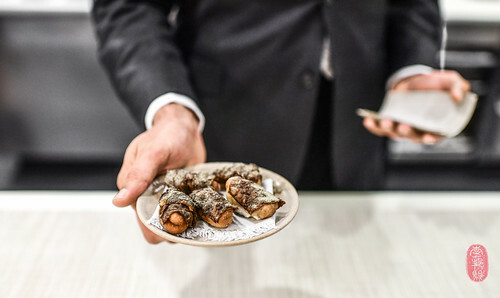 There was a canapé of brioche dough fried in a crispy shell of sunchoke skin, piped with sunchoke purée. That was delicious. Deboned chicken was rolled into logs, wrapped in its own skin, and fried. 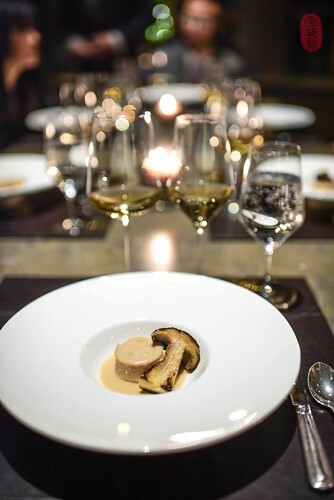 Sliced, the chicken was served with a creamy abalone sauce and fat porcini mushrooms. That was a great dish. 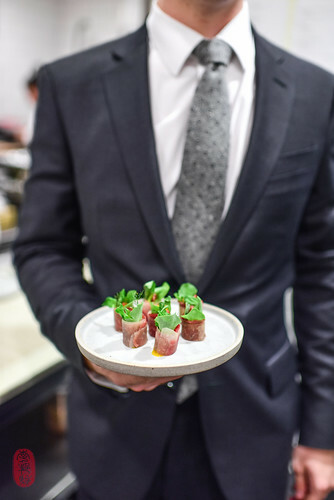 And The Restaurant at Meadowood also presented a dish of raw, aged beef, chopped into tartare, and served under a thin veil of seaweed and black trumpet mushrooms. It was warmed with a table-side pour of beef broth. The beef practically melted away. It was fantastic. Sukle made fresh cheese curd, similar to soft ricotta. It was strained during service and served warm with local persimmon compote and caramelized bread crumbs. The top of the cheese was drizzled with onion syrup, which was torched for a brûlée top. 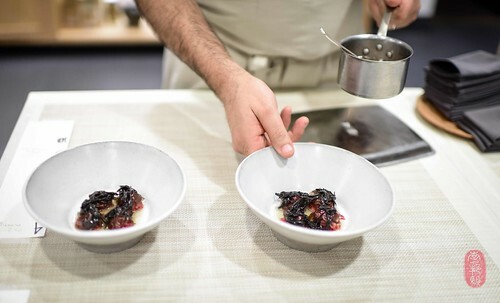 For dessert, he plated a variety of last summer’s stone fruits (all local to The Restaurant at Meadowood) – among which were fleshy peaches that, having been preserved, tasted strangely like apricots. The fruits were dressed in their own syrup, and plated with candied mix of pistachios, walnuts, hazelnuts, and almonds. Over all of this was spooned an aerated custard infused with beeswax. This was one of my favorite desserts of this year’s Twelve Days of Christmas. 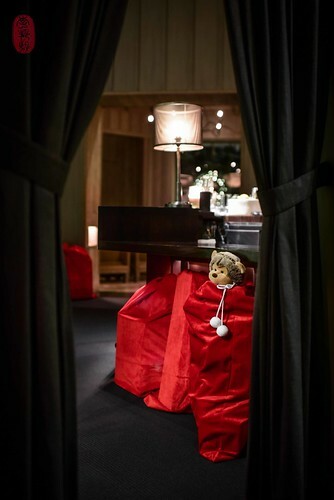 Below, you’ll find the menu from the fifth night of the Twelve Days of Christmas with Ben Sukle. To see all of the photos from this dinner, CLICK HERE. Kohlrabi, egg yolk cured in aged beef shoyu. Abalone, corn, porcini, and white truffle. 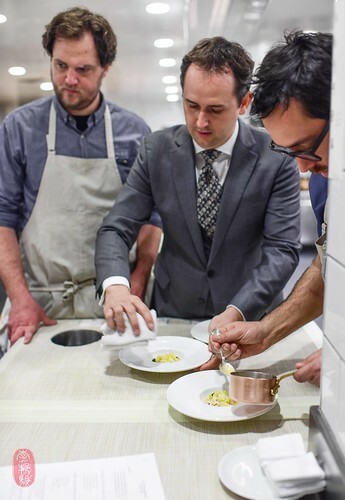 Photos: A canapé of brioche in crispy sunchoke skin; Sukle, Kostow, and cook David Guilloty live updating the night’s menu from The Culinary Farm; a canapé of aged beef and kohlrabi; Sukle, Nathaniel Dorn, and Kostow at the pass; Guilloty plating celeriac “aligot”; chicken and porcini; a tableside pour over rolled cabbage, apple, and sweet potato; aged beef with nori and black trumpet mushrooms; a scene from The Restaurant at Meadowood; Sukle plating a dessert of stone fruit; Kostow and Sukle at staff line-up. ~ by ulterior epicure on December 28, 2017.